Robert Whilhelm Eberhard Bunsen was born on March 31, 1811 in Gottengen, Germany. 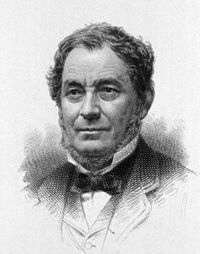 His father, Christian Bunsen was the chief librarian and a professor at the University of Gottengen where Bunsen studied chemistry earning a PhD in 1831 at the age of nineteen. After finishing his doctorate Bunsen spent three years traveling through Europe, partially at the expense of the German government during which he studied a multitude of subjects. When he returned to Gottengen he served as a lecturer in chemistry. Beginning in 1836 he taught chemistry at the Polytechnic School of Cassel, and in 1839 he was appointed professor of chemistry at the University of Marburg where he remained until 1851. After a brief stint at the University of Breslau, in 1852 he became chair of chemistry at the University of Heidelberg, where he remained until retirement in 1889. Bunsen's early research involved compounds of arsenic. He developed the use of iron oxide hydrate to precipitate arsenate which is still used to treat arsenate poisoning. He continued his studies of arsenic at the cost of almost poisoning himself and with the loss of an eye, injured by exploding glassware. One of his most lasting contribution to science was the invention of his eponymous burner. At the time chemists used oil and alcohol lamps as a source of flame. In 1854 Bunsen had gas piped into his laboratory and when none of burners available met his needs he developed his own, that produced a colorless flame, the intensity of which could be adjusted. Using his new burner Bunsen tested different chemicals and observed different colors and was able to detect different elements based on the colors produced. Sometimes color produced by one element would mask another and he used colored glass to mask some elements. Not satisfied with this solution, he mentioned his problem to Gustav Kirchoff, a Russian physicist and using two parts from telescopes, a prism, and a cigar box with its inside covered in black the pair made a prototype spectroscope. Using their new spectroscope Bunsen and Kirchoff quickly were able to identify different elements by their spectra. In order to find undiscovered elements Bunsen had 40 tons of mineral water evaporated and he was able to identify for the first time the alkali metal elements cesium (from the Latin ceasium, sky blue, named for its blue spectral lines) and rubidium (from the Latin rubidius, or dark red, named for its red spectral lines). Today spectroscopes are widely used in chemical analysis. Bunsen died on August 16, 1889 in Heidelberg.